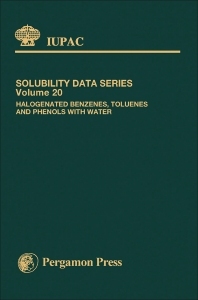 Solubility Data Series, Volume 20: Halogenated Benzenes, Toluenes and Phenols with Water contains a comprehensive collection and critical evaluation of published solubility data for halogenated benzenes, halogenated toluenes, and halogenated phenols in water prior to 1983. This volume is concerned entirely with the solubility behavior for condensed systems, such as solid or liquid solutes in liquid solvents, including the general behavior of the evaluated solubilities of water in various organic constituents as a function of temperature. This book focuses on liquid-liquid, solid-liquid, and multicomponent (organic-water-salt) systems. The solubilities of ordinary water and heavy water that have been determined in 29 organic liquids, which in all cases the heavy water was found less soluble than the ordinary water are also elaborated. The halogenated compounds outlined in this text have been organized according to the Hill System. This publication is beneficial to chemists and students concerned with the solubility data for halogenated benzenes, halogenated toluenes, and halogenated phenols in water.